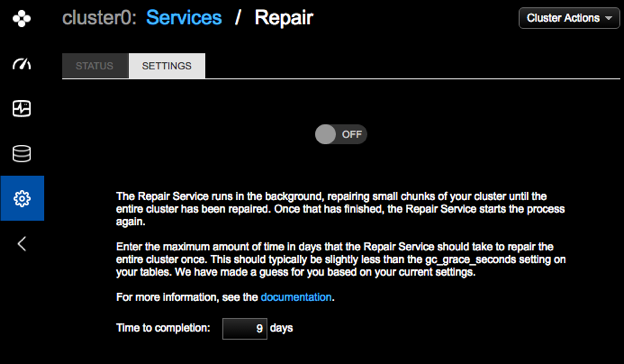 Configure the days for the repair cycle to complete and enable the Repair Service for a cluster. The Repair Service takes a single parameter, time_to_completion, which is the maximum amount of time it takes to repair an entire cluster per repair cycle. The Repair Service does not shut itself off. If necessary, turn off the Repair Service. The Repair service not enabled rule in the Best Practice Service fails until the Repair Service is turned on, unless the rule has been turned off. In the left navigation pane, click Services. Click Configure for the Repair Service. The Repair Service must be off to enter a completion value. Enter a value for Time to completion field if your environment requires adjusting the value estimated by the Repair Service. Note: Typically, you should set the Time to Completion to a value lower than the lowest grace seconds before garbage collection setting (gc_grace_seconds) on your tables. The default for gc_grace_seconds is 10 days (864000 seconds). OpsCenter provides an estimate by checking gc_grace_seconds across all tables and calculating 90% of the lowest value. The default estimate for the time to completion based on the typical grace seconds default is 9 days. For more information about configuring grace seconds, see gc_grace_seconds in the CQL documentation. The frequency of repair cycles during the time to completion is controlled by the time_to_completion_target_percentage option. For more information, see Adjusting or disabling the throttle for subrange repairs. Click the Off button to toggle the setting to On. The Repair Services starts and opens the Status tab. For more information about the repair status dashboard, see Viewing repair status.